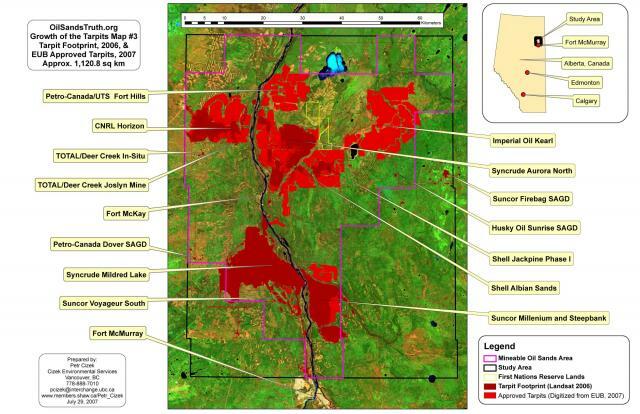 Map #3 shows the existing physical footprint of the tarpits in dark red combined with the projects that were approved up to June 2007 by the Alberta Energy and Utilities Board in red. These approved tarpit projects include: CNRL Horizon, Petro-Canada/UTS Fort Hills, Imperial Oil Kearl, Shell Jackpine, Shell Albian Sands, and the Suncor Millenium/Steepbank expansion. The physical footprints for the approved projects were digitized from maps in the Alberta Energy and Utilities Board's official project approval documents. The combined (cumulative) physical footprint of all the existing and approved projects would be about 1,120.8 square km, or about twice the current built-up (urbanized) area of the City of Calgary.